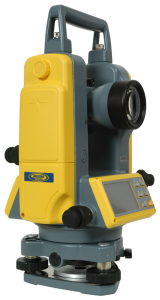 The Spectra Precision DET-2 is an affordable, powerful and well-equipped electronic theodolite that offers a variety of features and benefits that you might not expect to find on such an economically priced instrument. It was designed to provide its operator with highly accurate measurements in a wide variety of construction and surveying applications while also offering exceptionally uncomplicated operation for greatly increased productivity on the job site. Its versatility is evident in the number of applications it can capably handle including establishing 90 degree reference lines, setting elevations, pipe laser setups, advanced alignment jobs, basic to advanced grade work, leveling applications, and checking angles, alignment, and plumb. Numerous programmable settings ensure superior customization for the specific task at hand. The DET2's programmable settings options include zero position of vertical angle, Zenith angle, horizontal angle resolution, vertical axis compensation, 90 degree angle beep, vertical degrees or %, and automatic shutoff to conserve battery life. Dual control panels and large-character LCD displays make the DET-2 very accessible to all workers and easy to operate. Working in low-light conditions such as early morning and evening work or inside poorly lit buildings is a breeze thanks to the convenient LCD backlighting and reticle illuminator. Its rechargeable battery pack (holds a 36 hour charge) and charger ensure economical operation and the included backup alkaline battery pack (uses 4 standard AA batteries) allows you to easily keep working if the rechargeable battery runs out of charge in the field. The DET-2 is also ruggedly built and water and dust resistant so you can use it without worry when working in demanding environmental conditions. If you're looking for an affordable digital theodolite that doesn't skimp on features you owe it to yourself to check out the DET-2 from Spectra Precision. New and used Spectra Precision DET-2 theodolites available on eBay. Spectra Precision DET-2 Digital Electronic Theodolite 2" Acc. Instant conversion of vertical angles to percent of grade - convenient for slope work and when used in conjunction with DialGrade pipe work. Minimum Reading: 1" or 5"